» I just called to say ‘whattup’. Don’t Eat Off The Sidewalk! I just called to say ‘whattup’. It’s pretty late, i’m pretty tired. Sorry if i’m not super wordy. Tomorrow I have to go to the library and argue with Brian over which car we’re going to buy. We have it narrowed down to two, and the one I like more is losing. That makes me sad. The other car is fine, but I like the inside of mine better. And it’s a pretty color of blue! I will post pictures when I have them. By tomorrow, we should own a car that actually starts right away and doesn’t leak fluids. That’ll be nice. So here’s some food. First, we have another tester recipe from Joanna. 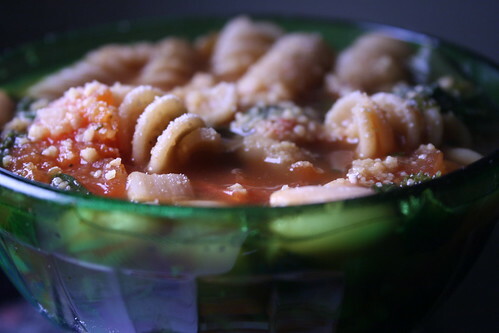 Pasta E Fagioli. It’s a hearty soup, a meal in itself. Tasty and filling. I’ve eaten 5-6 bowls and I still have some left. 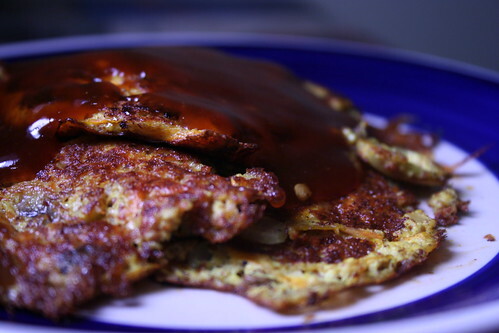 I decided to try and make vegan egg foo yung last weekend. If you’ve never had it, it’s just a tiny omlet, fried. They usually have meat in them, but they make vegetable ones too. When I went to the bufet with my in-laws, I would get a couple patties, some rice, and some sweet and sour sauce and be happy. I decided to use silken tofu, and ground flax seeds mixed with water for the binder. I added some salt and pepper, and a little tumeric for color. 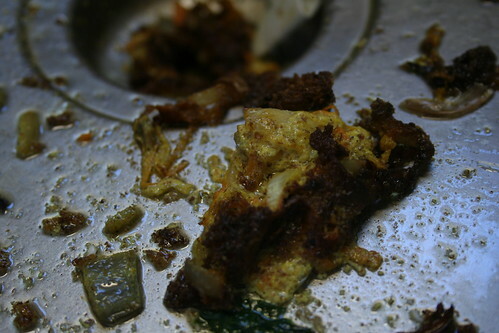 I chopped and grated mushroom, pepper, carrot, and onion and folded it in to the tofu. Then I tried to cook the rest as one big pancake , but that didn’t work out. Mostly because I called my mother-in-law and forgot it was on the stove and it ended up burning. But I was pretty tired of the experiment by then anyway. It was awfully tedious. Then I find out that there’s a recipe in the Chicago Diner book. God dammit. Tonight, Brian and I made our first test recipe for Vegan Yum Yum. 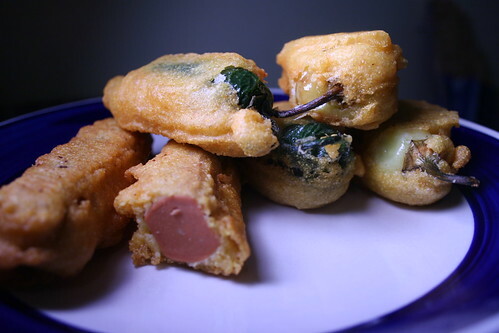 We did the Jalapeno Poppers. I can’t tell you about the recipe, but the batter is pretty amazing. I didn’t take any money shots, sorry. We had some leftover batter so I made corndogs as well. I’m going to make some more for future lunches as soon as I figure out how to make the batter more fluffy so you taste less dog and more battery goodness.